Not to worry, this formula can be simplified further to arrive at the kind of formula we would enjoy using. For instance, imagine a landlord receives $100,000 in cash flows after expenses from an apartment building that he owns. These cash flows are expected to rise at 7% a year level, and we assume that this rise will continue indefinitely. Having assumed a discount rate of 12% a year, what is the present value of this perpetuity? Here are 3 important points to consider when using the simplified formula for growing perpetuity. i) The numerator: The numerator is the given Cash flows in a particular period, e.g. in 1 year. It is not a time stamp or the # of periods; it is the cash flows that are generated in that period. ii) The Interest rate & Growth rate: The interest rate ‘r’ must be greater than the growth rate ‘g’ in order for the growing perpetuity formula to work properly. The larger the growth rate gets when compared to the discount rate, the more the present value of the growing perpetuity. iii) Timing of Cash flows: Most businesses have cash flows come in random times during the year, as sales are not guaranteed. In the case of the landlord, we might have tenants moving out and the apartment units remaining empty for months before they are filled with new tenants. This makes the series of cash flows discontinuous. 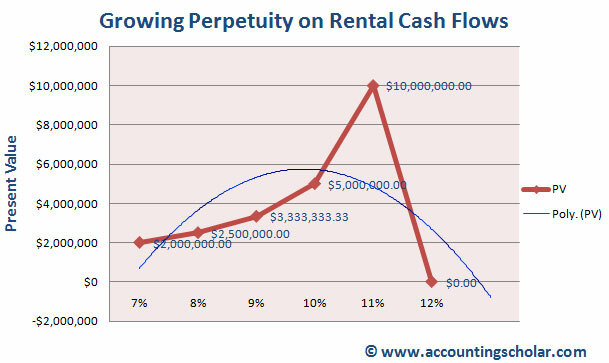 However, our growing perpetuity formula assumes the cash flows happen at regular & discrete points in time and they are consistent and do not change. Again in the case of the apartment building, we assume the landlord will get $100,000 in rent every year, however most tenants would like to pay monthly, thus the frequency of cash flows changes. Here is an interesting measurement on what happens if the growth rate of these perpetuity payments increases from 7% to 12%. From this graph, we can see that when the growth rate increases from 7% to 8%, the present value of the growing perpetuity increases from $2 million to $2.5 million. When the growth rate reaches 11%, the present value of the perpetuity peaks at $10 million and notice that when the growth rate is 12%, we get an answer of #DIV/0! Meaning this is invalid; the growth rate and the discount rate can never be the same!